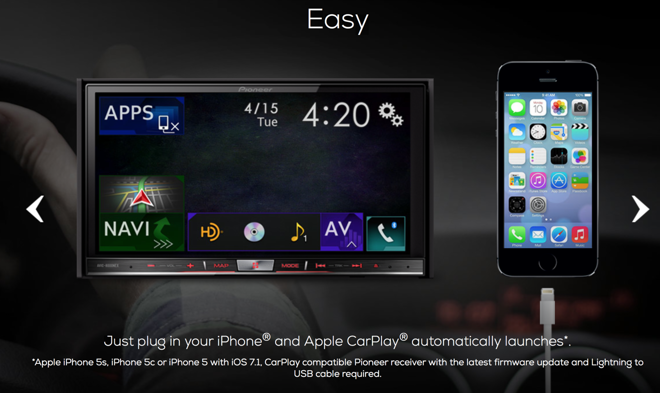 Pioneer had originally demonstrated CarPlay support for its NEX aftermarket car systems back in May, promising that the update would become available to users in "a few weeks." That update was finally supplied by the company on Thursday. Firmware updates are now available to download for the AVIC-X8610BS, AVH-4000NEX, and the AVIC-5000NEX, 6000NEX, 7000NEX and 8000NEX. 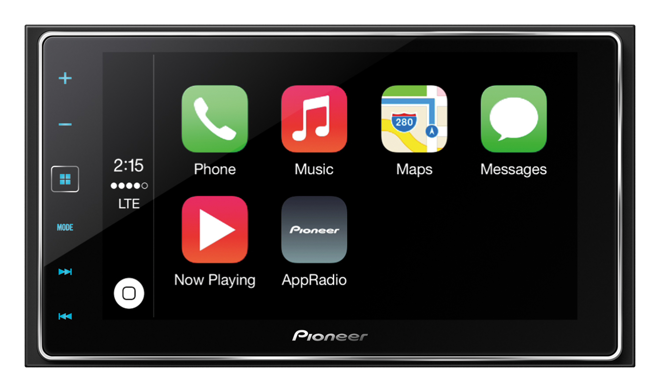 Pioneer on Thursday also introduced a new, more affordable $600 unit called the AppRadio 4 featuring a 6.2-inch WVGA capacitive touchscreen. CarPlay is compatible with iOS 7.1 or later running on an iPhone 5 or newer. Pioneer's units also support Siri Eyes Free, which provides voice prompts to users and receives commands through an external microphone built into the head unit. "The new AppRadio 4 embodies our idea of the connected car, providing the majority of smartphone owners the ability to utilize their devices in the car for calling, streaming music, and even controlling supported apps to enhance their driving experience," said Ted Cardenas, vice president of marketing for the Car Electronics Division of Pioneer Electronics. Out of the box, CarPlay supports native Apple applications including Music and Maps, while select third-party developers have been announced. Among those is Spotify, which added support in an update to its official iOS application on Thursday. Spotify version 1.8.0 allows users to play Spotify in a CarPlay equipped vehicle by connecting a compatible iPhone. The update also adds support for Swedish and Quebec French.